Sail the icy waters of the Inside Passage, see glacier-capped mountains, winding fjords, small islands and wildlife. Sail to blue-lit Hubbard Glacier—a fitting introduction to a region where nature makes the rules and people follow them. Learn native Tlingit history in Icy Straits. Explore the Russian fur-trapper culture of Sitka. Soak up all the beauty of Haines without the crowds. 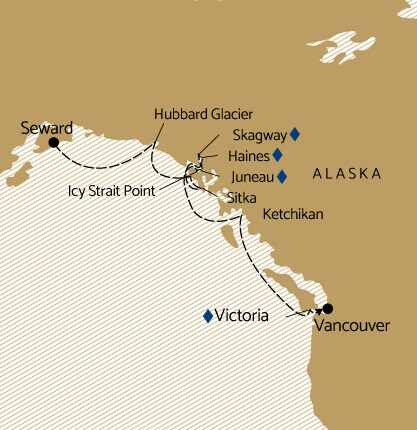 10 nights aboard Azamara Quest cruising the Inside Passage from Seward (Canada) with scenic cruising at Hubbard Glacier and port calls in Icy Strait Point (Alaska), Sitka (Alaska), Juneau (Alaska), Skagway (Alaska), Haines (Alaska), Ketchikan (Alaska), Victoria (Canada). Includes on board meals and entertainment. You’ll never feel crowded in the comfortable social spaces of our bars, restaurants, lounges, and Cabaret. Staterooms feature modern amenities, furnishings, and European linens. And one of the greatest features of this ship is the large number of staterooms with verandas.